Training high performance horses for maximum energy and endurance is key to ensuring the horse's ability to be competitive, fare well during competitions, cross the finish line first, and recover quickly after winning. During high intensity exercise, horses experience rapid catabolism of carbohydrate, which can cause lactic acid build-up and a reduction in muscle pH that will interfere with maximum performance. Horse supplements for equine athletes help to counter these effects and produce better performance before, during and after competition. Dr. Richard Godbee, both an equine expert with a Ph.D. in Nutrition as well as a competitor, discusses the energetic and physiological aspects of competitive horses and how supplements can help horses have the physical and mental capacity to withstand fatigue and obtain maximum athletic performance. Exercise is often described as being either aerobic (where oxygen is plentiful for metabolism) or anaerobic (where there is insufficient oxygen). One way to better understand these two concepts and how they relate to fitness is for you to consider the following scenario: You are standing at the bottom of several flights of stairs. First, you walk up the flights. Depending on your level of physical fitness, you most likely will notice that you are breathing normally. You walk back to the bottom of the stairs, and this time you decide to run as quickly as possible up the same flights of stairs. For most people, running up the stairs will have them breathing very hard or in an oxygen deficient state, i.e. anaerobic. In both instances, energy was required but the source of energy and metabolic pathway in each differed. Ultimately the same energy substrate, ATP, was formed and supplied energy to the muscles. However, the first case (walking up the stairs) resulted in aerobic metabolism in which carbohydrates, proteins and fats could be used as energy sources and water and CO2 was the end product. Under the second case (running) anaerobic conditions were produced and glucose or glycogens were the energy sources and lactic acid was produced as the end product (fig. 1). Anaerobic metabolism will supply energy (ATP) for high intensity/short duration exercise, however the accompanying depletion of glucose or glycogen coupled with accumulation of lactic acid results in a short time to exhaustion. Physical conditioning (cardiovascular) is the primary means to improve physical stamina and prolong the time to exhaustion. Research data suggest that the horse enters the anaerobic threshold when the heart rate rises above 150 beats a minute. At this level, lactic acid begins to accumulate faster than it can be removed. Heart rates above 200 lead to rapid fatigue. Fatigue is a combination of loss of energy/oxygen supply in addition to an increase in the accumulation of waste products in the cell, e.g. lactic acid. Lactic acid lowers the pH in the cell and inhibits energy production required for muscular contraction. This is probably one reason horses seem to "slow down" at the end of a race. Elite equine athletes are trained and conditioned for specific activities on a very strict schedule to maximize their stamina and energy utilization. Horses competing in speed or power events (racing, show jumping, cutting) more often employ anaerobic pathways than horses participating in sub-maximal exercise, e.g. endurance riding. For the weekend warrior (the horse that is used occasionally but is not trained daily), the impact of anaerobic metabolism is exacerbated, fatigue occurs more quickly and lactic acid accumulation is faster. As with the weekend warrior who plays basketball only on the weekends and experiences soreness from lactic acid accumulation afterwards, the weekend horse experiences the same affect. The health and performance of equine athletes, whether weekend warriors or elite competitors, also depends heavily on good nutrition. To properly use energy either anaerobically or aerobically, sufficient quantities of vitamins are required in the diet. These include specific B-vitamins, like thiamine, riboflavin, niacin, and Pantothenic acid (needed for enzyme systems required for energy utilization). Oxidative stress is also heightened in horses with increased exercise so good antioxidants are required to help remove free radicals. Many competitive riders use supplements to help meet the nutritional as well as physiological needs of their high performance horses. 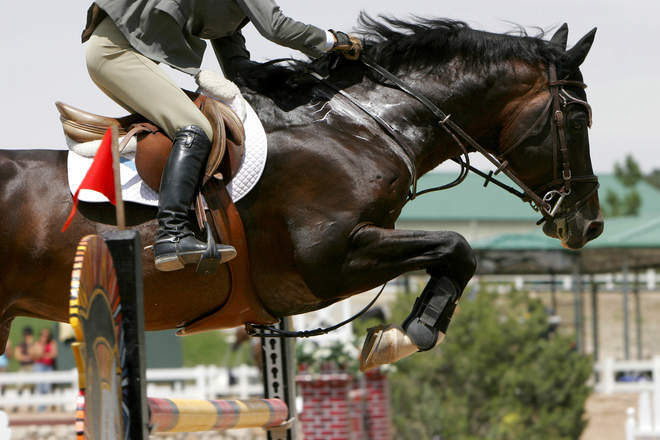 Lactanase®, a horse supplement created specifically to address the metabolic and energy needs of equine athletes, is used by riders around the world. With an exclusive formula developed by Vita Flex's team of equine nutritionists, veterinarians and biochemists, Lactanase® enables the release of energy from both carbohydrates and fats, which in turn helps to support optimal muscle function and metabolism in competition horses. As in the words of Lisa Wilcox, Vita Flex Victory Team rider and leading international dressage competitor, "Lactanase® is what helps to put me and my horses above and beyond the rest. With this supplement, I can do a rigorous training, spend 45 minutes to an hour with walk breaks and the next day be assured my horses won't have stiffness. When I'm training my horses to have the kind of energy and endurance they need to compete in the Grand Prix Special, it's important they don't build up lactic acid which could interfere with how they feel, how they perform or even how they perceive me. I rely on Lactanase® to prevent the lactic build up so the muscle the horse is building stays protected and the horse is happy and healthy."